In 1996 the Internet was still young, and George Lucas was making changes to Star Wars. The Bogus Star Wars Homepage to chronicle it, collecting what the fans were finding, and directing my hopes to what Industrial Light and Magic might do with its new tools. (The page is pretty long in the tooth design-wise, and is a time-capsule of thoughts prior to rerelease) Little did we all know how much would change, but it was incredible to see Star Wars coming out again. Invariably in the online discussion on AOL, the question of Ken Ralston’s tennis shoe came up, and where he hid it in the film jousted for prominence. Someone gave us convincing evidence that it was in Empire Strikes Back, and Ralston had mis-spoke. I excitedly passed the image on, and marked it up to point out the evidence. It is 2013, and video resolution is equal to that of most films. This allows us all to re-analyze the claim, as the new resolution and digital tools shed more clarity on the subject. All right, the potato was a stretch, as what do most asteroids look like? Potatoes, obviously (Young internet — we accepted a lot of questionable information back then). Analyzing the second object in the FG, it is clear that it has a magenta color shift, while everything else is color-balanced, and its shape is roughly that of an Addidas shoe of that era. It is distinctively shoe-like. 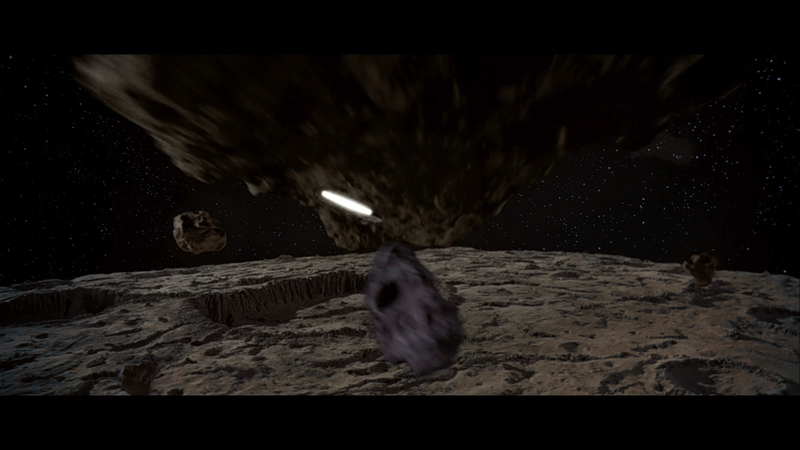 Since I have some visual effects prowess, I employed the same technique I used to recover the shape of the probe droid ship on the DVD menus (images of the model were not in the archives at that time, as far as we could tell, but that has recently changed). The technique uses motion vector analysis – normally used to ADD motion blur – to partially de-convolve, or un-blur the image. It’s not a perfect recreation, but it does give you more clues about the original shape. Sharpened TESB frame using de-convolving. According to this analysis that is not a shoe. It seems to be just a moderately composited element that did not get correct color timing applied to it — but what an interesting random happenstance, due to Mr. Ralston’s subversion in Jedi. For incorrectly joining the fray in 1996, I have to say sorry: No shoe in TESB. Hopefully someone can find it in Jedi. Though there is a tennis shoe easter egg in the DVD (not Blu Ray) menus. Trust me. p.s. The information will remain unchanged on the original post — which exists in two locations, as an internet provider went out of business, but their servers got backed up to the web somewhere. I know this article is ancient, but you mentioned that you got the images from the blue-ray. Wasn’t the blue-ray released after Lucas started making edits to the film? I’m pretty sure you couldn’t get the original releases until Disney took it over. There are other edits made to correct errors, like taking out some ghostly tie fighters, and etc. To be fair, though, the original footage also doesn’t look much like anything very clear.